“The only thing that’s changed is everything.” That’s how Apple describes its iPhone 6s and iPhone 6s Plus. Indeed, it’s true. iPhone 6s has added the 3D Touch which senses how deeply you press the display and enables you to do things more quickly and simply. The camera has also been improved a lot, letting you take sharp selfies and 1080p HD videos. And its advanced 64-bit A9 chip makes your game experiences faster and more exciting than ever before. Do you want to show others cool stuff on your iPhone 6s? Then, just send them some screenshots. 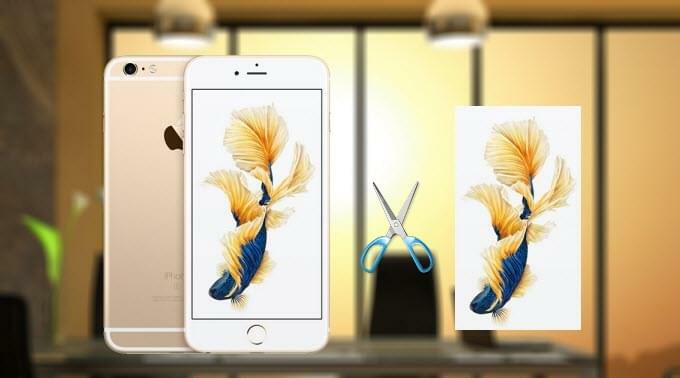 And this article tells you how to take screenshot on iPhone 6s and iPhone 6s Plus in two ways. On iPhone 6s and iPhone 6s Plus, you just need to press the “Power + Home” buttons at the same time to take a screenshot. There will be flash on the screen and a camera shutter sound if your iPhone is not in silent mode. And then, you can find the screenshot in the “All Photos” folder or “Screenshots” folder in the Photos app. Aside from iPhone 6s and 6s Plus, you can also use this method to take screenshot on iPhone 6, iPhone 6 Plus, iPhone 5s, iPhone 4, etc. 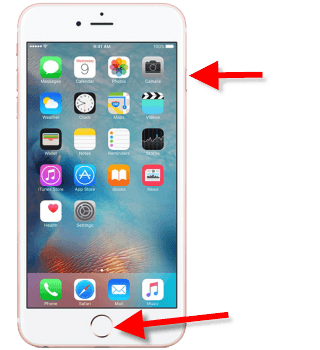 If the physical power button or home button doesn’t work well, then you can use Apowersoft iPhone/iPad Recorder to screenshot iPhone 6s and 6s Plus. This app is able to mirror your iOS device screen to PC/Mac wirelessly. It also provides functions of recording screen and taking screenshot on your iPhone/iPad with just one click. And the recorded videos and screenshots will be automatically saved to your computer. Here are the detailed steps of using it to capture an iPhone 6s screenshot. Install this tool on your computer and open it. Next, set your iPhone 6s and your computer in the same network. Swipe up from the bottom of the screen on your iPhone 6s to open the Control Center. Then, tap on the “AirPlay” button. After that, the AirPlay list will pop up on your iPhone. Choose your computer name on it and turn on the “Mirroring” option. Then, your iPhone 6s screen will be immediately projected to the computer. This app can also automatically detect the iPhone’s orientation (landscape and portrait) and mirror the screen accordingly. Display what you want to screenshot on your iPhone 6s, and click the camera icon above the projected screen on computer. A new window will pop up with the screenshot (in PNG format) in it. You may want to edit the screenshot after taking it. One of the best apps that you can use is Skitch. It can crop, add lines, texts, mosaics, highlights and many more to images. After editing, you can save the image on your iPhone 6s, send it to your Evernote account, mail it or share it to Facebook, Twitter or other apps on your phone. This app also provides other functions like Map for taking screenshot of locations or routes, PDF for viewing PDF files and Draw for sketching ideas. Monosnap is another app that you can use to edit screenshot on iPhone 6s and iPhone 6s Plus. Once you’ve installed it, you can log in with your Monosnap account. 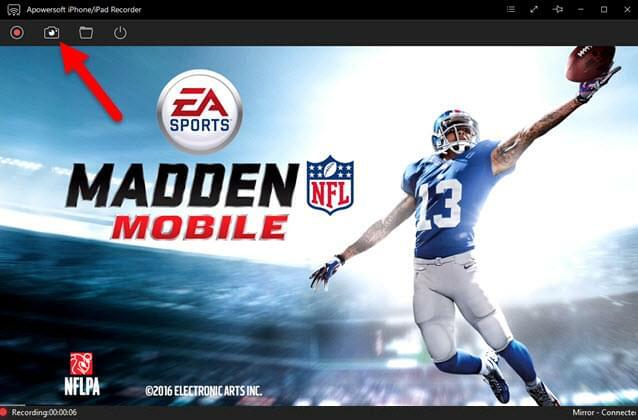 Or, you can also try the offline mode directly. The offline mode enables you to crop, blur, draw lines, arrows and texts on the image. After editing, you can upload the image to the cloud space provided by Monosnap, share it to Facebook and Twitter, send it via email and SMS, or just save it to the Gallery. This article provides two ways on how to screenshot on iPhone 6s and iPhone 6s Plus and introduces some apps for editing the screenshots. The default way of taking screenshot is simple and fast, but if you have problems using this method, you can always use Apowersoft iPhone/iPad Recorder as a backup. Plus, this app allows you to manage and back up files on your iPhone 6s and iPhone 6s Plus.